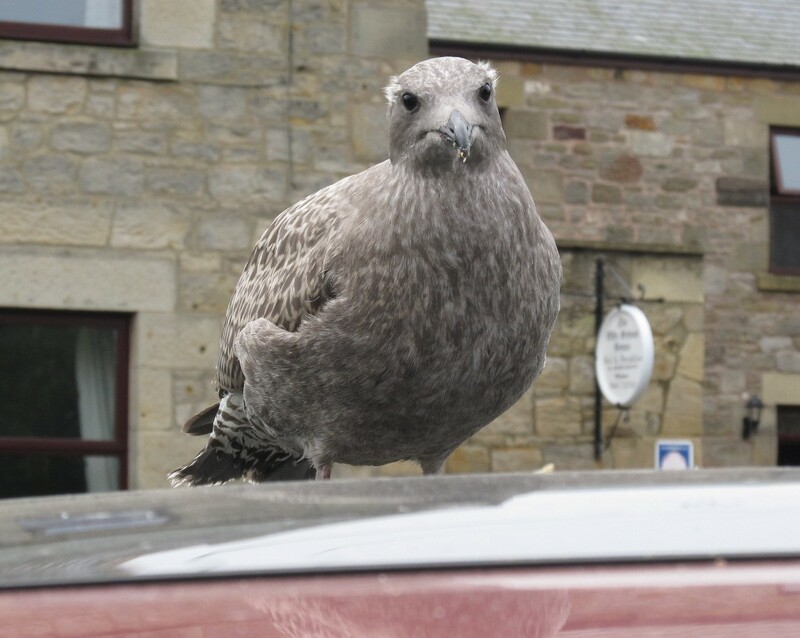 On this morning’s Radio 4 repeat of Tweet of the Day, we were reminded that, despite the feeling that these birds are everywhere round here, the herring gull is actually on the red list for conservation, its numbers declining in coastal areas. 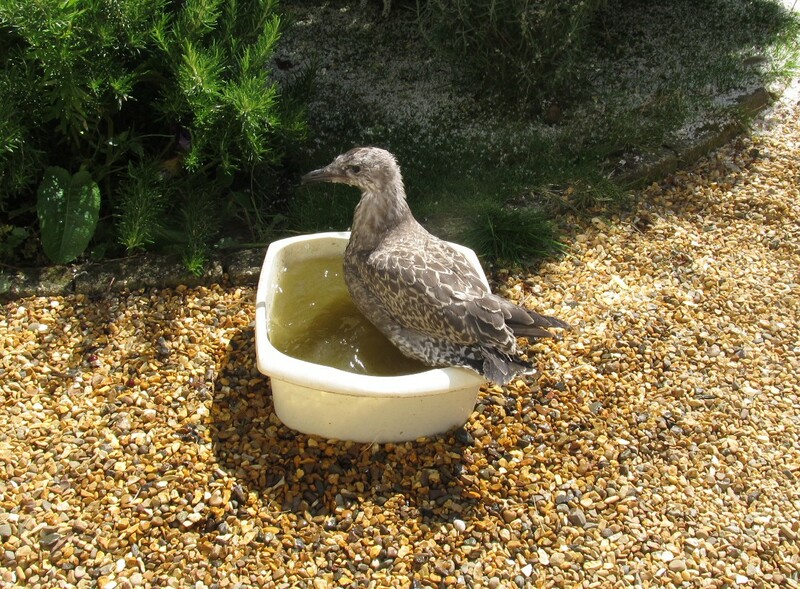 As regular readers will know, however, we have always supported our local roosting herring gulls and the antics of this year’s brood – Peter, Paul and Mary – on next door’s chimney. Last week I reported that Peter’s early attempts to stretch his wings resulted in a fall to a lower level. Well, since then, we have come to look into his delightfully beady eyes, a privilege we had not anticipated and have had to become actively involved in his care. Within a day or two of taking up his post on the bay window he flapped to the ground and since that time has wandered back and forth, up and down the drive, sheltering under the generous rhubarb leaves and making his needs known to both us and his parents by his plaintive peeping. So out have come tins of sardines and tuna to share with him, and he has been drinking and bathing regularly in the Mantalinis’ washing-up bowl. He recognises us all and, though careful of his own safety, obvious trusts us. 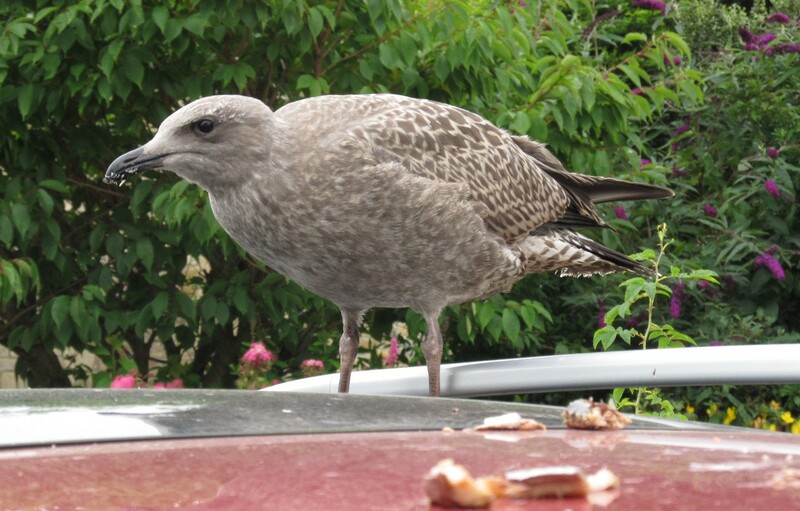 As for his siblings: they flew off within a day of his initial fall from the chimney and though occasionally perching on neighbouring house-tops from time to time, have all but left their childhoods behind, concentrating now on the more advanced courses a gull must pass in order to achieve independence. Though Peter can fly his way out of danger, he shows no desire yet to make a break for it and, while he makes up his mind about the time to go, we will keep an eye on him. All this dithering reminds us of his great-great uncle, Nigel, two years ago – it was ages before he found the confidence to leave home. Bless him! ‹ PreviousAnd if one brown seagull should accidentally fall . . .